On June 25th, in 1530, a group of German princes stood before Emperor Charles V, in the city of Augsburg, and made a confession of the true, orthodox, catholic, Christian Faith. Their confession began with a verse from the Psalms: “I will also speak of Thy testimonies before kings, and shall not be put to shame” (Ps. 119.46). This confession, although recently written, was nothing new. It was something very old – a confession of the teaching of Holy Scripture and a correction of abuses that had corrupted the Church. While written by Philip Melanchthon, the princes and churches that subscribed to it made it their own. 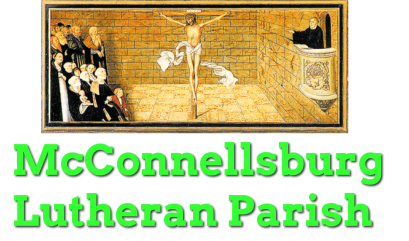 When I was ordained into the Office of the Holy Ministry, and again when I was installed as the called pastor of the McConnellsburg Lutheran Parish, 1 was asked about the Augsburg Confession and our other confessions and creeds. I not only said that I agreed with them; I also confessed, “I make them my own.” This is what it means to be a confessional Lutheran: we aren’t just paying lip service to old documents, we are making them our own, confessing and living the once-for-all-time faith of Jesus Christ and His disciples. “They knew one thing which the modern man does not know, and does not care to know. They knew that … we literally live by the truth or we die by falsehood. Hence they never shared the cold skepticism … of modern relativism, which holds that there are only relative truths, and that it consequently does not pay to wrestle for the truth…. Their quest after the truth … was conditioned … by the conviction that there is One who is the Truth in person. One who said, to truth seekers of all ages, “Everyone that is of the truth hears My voice” (Jn 18:27). The Augsburg Confession was made in 1530 for the sake of the saving Gospel of Jesus Christ. By God’s grace, still today in the year of Our Lord 2015 we say our “Amen” to the same confession, for it is the same faith in the same Jesus in every generation that saves. St. Paul says in Romans, “So then faith comes by hearing, and hearing by the Word of God.” That is what the Augsburg Confession is concerned to preserve: the Word of the Lord which alone has the power to create faith. In this day, when contending for doctrine is highly unpopular, we continue to assert the narrow way of the Lutheran Confessions not to prove we are right, better or smarter, but in the humble acknowledgement that only the pure Word of God can give us true comfort and sustain the Church against her enemies. “Faith comes by hearing, and hearing by the Word of God.” And so we give thanks for the confessors at Augsburg who heard that Word and were not ashamed to speak it before kings. We continue to make their confession our own, and resolve to keep it though the world hate us for it.